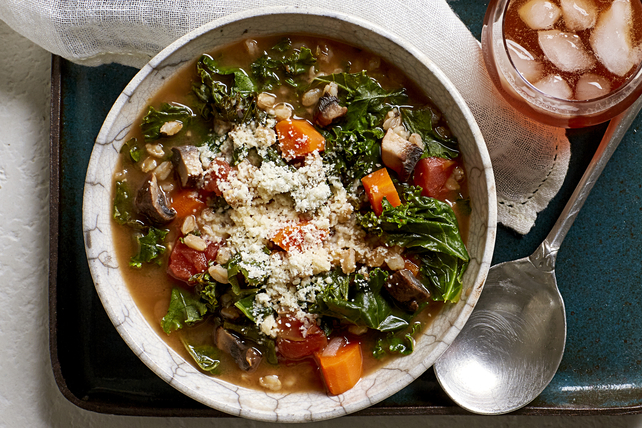 Try this delectable Kale & Farro Soup recipe today! Our hearty Kale & Farro Soup includes a variety of veggies which team up to provide a range of great flavours. Heat dressing in large saucepan on medium heat. Add onions and mushrooms; cook 6 to 8 min. or until mushrooms release their liquid and are evenly browned, stirring occasionally. Add all remaining ingredients except cheese; stir. Bring to boil; simmer on medium-low heat 30 to 35 min. or until farro and kale are tender, stirring occasionally. Prepare using 25%-less-sodium vegetable broth. Prepare using Kraft Extra Virgin Olive Oil Italian Pesto Parmesan Dressing.